Hello! 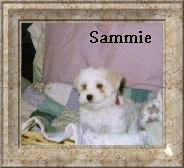 My name is Sammie! I would like to join your Poo club! 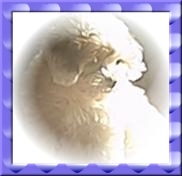 I am a malte-poo (maltese poodle)! I was born on Jan. 29, 2001 , I think! 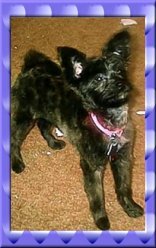 I love my owner, Cameron who lives in Greenville, SC. She is always very nice to me! I love cheese, especially swiss cheese! When ever Cameron eats it I always try to steal it from her, but she always says "No!" I am completely white with a tiny bit of brown. I have red spots under my eyes from the the stuff that comes out of my eyes. I love to play with plastic Easter eggs! I don't understand how they always slip out from under my paws! Well, I guess that's it! I can't wait to be in your club! Wally was born on the 7th March, 2000. He is a wonderfully loving, friendly, cheeky, smart and often mischevious woofo. He attends obedience training, which he tolerates, and flyball training, which he looooves. He adores going for daily walks by the creek or beach, and, of course, can't get by without a wrestle with Buster, his backyard mate. Wally is the best dog a person could ever hope to find. Hi there! 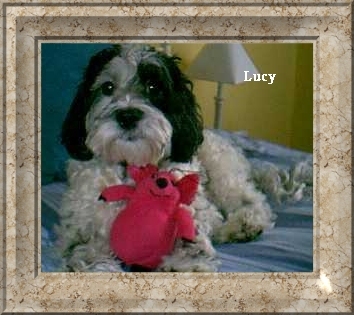 My name is Lucy and I am a 4 year old, spunky, spitfire of a cockapoo. Just look at my pictures and you can see how much of a "cockapoo" attitude I have! I was born on June 18, 1996. 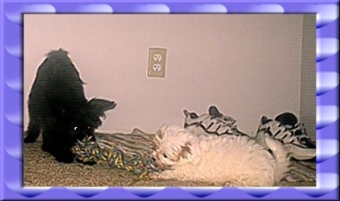 My early life is somewhat of a mystery as I ended up in a shelter in Maryland. I was only there for one day before my parents found me. Boy, was I lucky! Randi and David Brown, my parents, have given me a wonderful home with lots of love and affection. The only problem is that they recently adopted a brother for me. What were they thinking?!? I now have to spare my house with a 2 year old Corgi. He's not up to my level of sophistication. He's not that bad, but I like to play the victim. Yes, I am a drama queen!! My life is a happy one and my parents always tell me what a great dog I am. I sleep with them in bed every night, too! What more could a cockapoo ask for!? !